Commissioned for and sponsored by the National Recording Preservation Board of the Library of Congress. 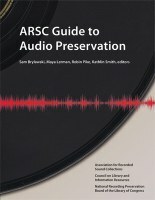 Copublished by the Association for Recorded Sound Collections, the Council on Library and Information Resources, and The Library of Congress… The ARSC Guide to Audio Preservation is a practical introduction to caring for and preserving audio collections. The guide, which includes sections on preservation, conservation, formats, appraisal, disaster preparedness, copyright and fair use, and digitization, is available as a free download. Print copies will be available later this month.